How can we study effectively? 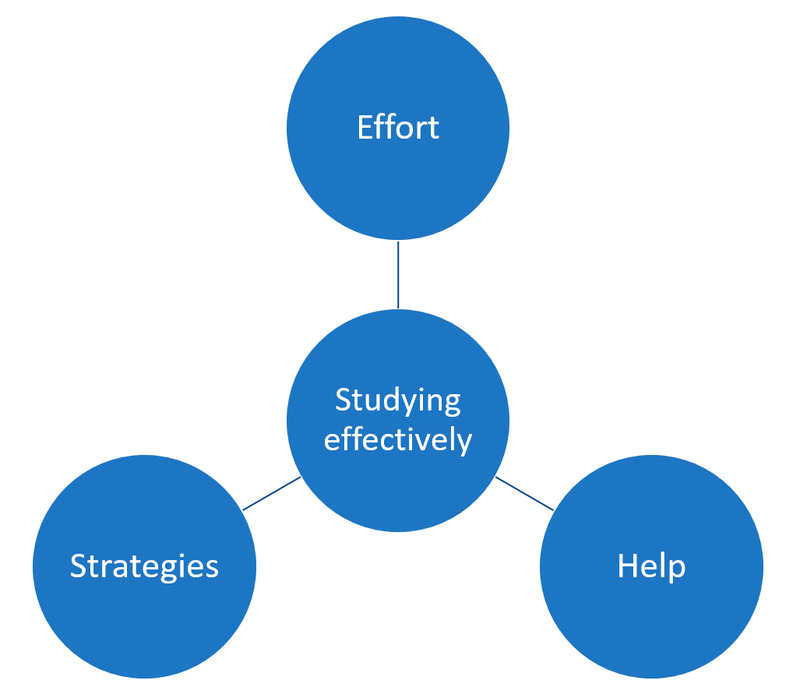 Below, I describe three dimensions of studying effectively. These are not only meant for young people in schools or universities. Nowadays, lifelong learning has become normal. Keeping on learning and studying is healthy for us. Keeping on challenging ourselves cognitively is one factor contributing to a healthy life. Knowing how to study effectively is beneficial for anyone at any age. The tips below can be used for studying from books but also for other purposes, for example for learning to play a musical instrument. Acquiring new knowledge and skills requires putting in enough time and persevering when things get hard. Research by Carol Dweck (read more) has demonstrated that people in fixed mindset view having to put in a great deal of effort into something as a sign of lack of natural ability. They view it as a matter of honor to not put much effort into studying. Also they are inclined to give up more easily when studying gets difficult. When they experience setbacks they tend to think that they lack ability and are just not good at what they are trying to learn. People in a growth mindset realize that effort is essential for acquiring new knowledge and skills. When they find learning hard or experience setbacks they don't easily give up but interpret this as sign that they have to persevere. They feel smart when they are doing things which they find hard. Effective learning requires putting in sufficient effort and time in studying and persevering when things get difficult. It is also important to use the time you invest into learning effectively. A lot is known about how to spend studying time effectively. One strategy is deep work. While working deeply you work highly focused in blocks of, for example, an hour. During these blocks you make sure you won't be interrupted by external distractions such as Whats app messages, e-mails, etc. You also do your best to not distract yourself by starting to think about other things or starting to do other things. By working in this way you may reach a deep focus due to which your learning outcomes may be much bigger. Also, you may use findings from cognitive science. In a previous article on this website, Jamie Hale has listed things which are known about how to study effectively: (1) Don't spend excessive time worrying about whether or not you will remember the information, (2) Try to think about the meaning of the information and how it is related to other information you already have stored memory, (3) Paraphrase the information you are trying to remember, (4) Test yourself on the information you are trying to remember, (5) Memory is best when you spread your studying across multiple sessions (spaced learning), (6) Cramming should be avoided, (7) Strong memory reflects a strong understanding (meaning and connections of various memories), (8) Mnemonics are helpful in some circumstances, but at other times not recommended, (9) The key foundation of strong memory is UNDERSTANDING!, (10) Studying should be structured and involve immediate goals that can be attained with each session. Finally, you may use deliberate practice (read more). With deliberate practice you formulate concrete learning goals. You focus on what you find difficult and practice that in small parts and with repetition. While doing this you get immediate reliable feedback about your performance. You keep repeating until your performance gets better and better. You are constantly aware of how difficult you find the exercise and keep focusing on parts of your performance that need improvement. Deliberate practice can be seen as a process of eliminating mistakes using a clear norm of excellent performance. An important dimension which many people overlook in studying is to get help. People in a fixed mindset are not inclined to seek help. They view needing help as a weakness because they interpret it as a sign a limited ability. People in a growth mindset view asking for help as a legitimate and useful part tool for studying. When studying difficult subject matter it is normal that you sometimes don't understand it, even when you have put in a great deal of effort and time. When that happens you may give up or keep on trying. But the first option will not lead to progress and the second option sometimes requires more time than you have available. In such circumstances, asking for help is wise. What matters is that you understand the subject matter eventually. It does not matter is how you got there. Help by others may be a good way to get there. Help by a good teacher is usually essential for learning complex skills and knowledge. A teacher can help design exercises and give useful feedback. So don't hesitate to seek a tutor when you need some extra help at studying. A more indirect form of help is the following. When you have to study it can help to seek the company of other people who also need to study hard. People are sensitive to the presence of other people and are inclined to do what others do (this is called the social facilitation effect). When we seek out the company of other people who study hard and effectively, this will make it easier for us to to do the same (read more).